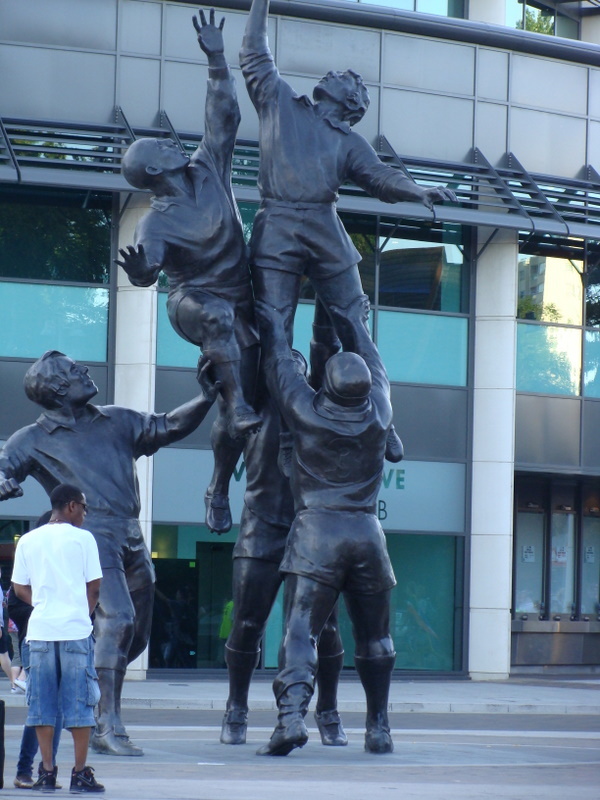 Two more tickets landed in our red box last night when we returned from a full day at Twickenham, the home of British rugby in London. We left in bright London sunshine and returned in balmy dusk, having had an amazing new experience in this city. 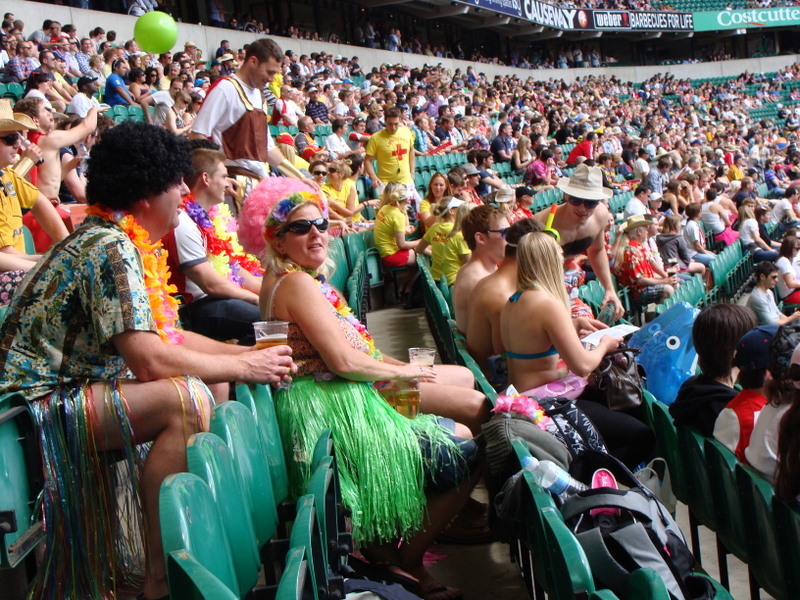 We were two of the world record crowd of over 54,000 at the first day of an international 7s rugby tournament, one in which our Saffa team – the Springboks – feature in the top four in the current standings, having being world champions in the 2008/09 season. It was too exciting to see our boys in green running on to the pitch to take on a series of rivals throughout the day: sixteen teams from around the world take part, namely New Zealand, Australia, Fiji, Samoa, Argentina, USA, Canada, Russia, Argentina, South Africa, Kenya, Spain, Portugal, Scotland, England and Wales. South Africa was ranked fourth at the beginning of this, the penultimate match of the series. The rugby, which was brilliant and hugely entertaining, continued relentlessly through the day. South Africa won two of its three matches of the day, which means it went through to the quarter final of the cup event today, and we wait to see what happens next. The home crowd went ballistic when the England squad appeared in front of our stand to warm up – grown men stood and applauded spontaneously, some almost wept with pride as their team ran up and down the width of the rugby field to prepare for their first pool game. 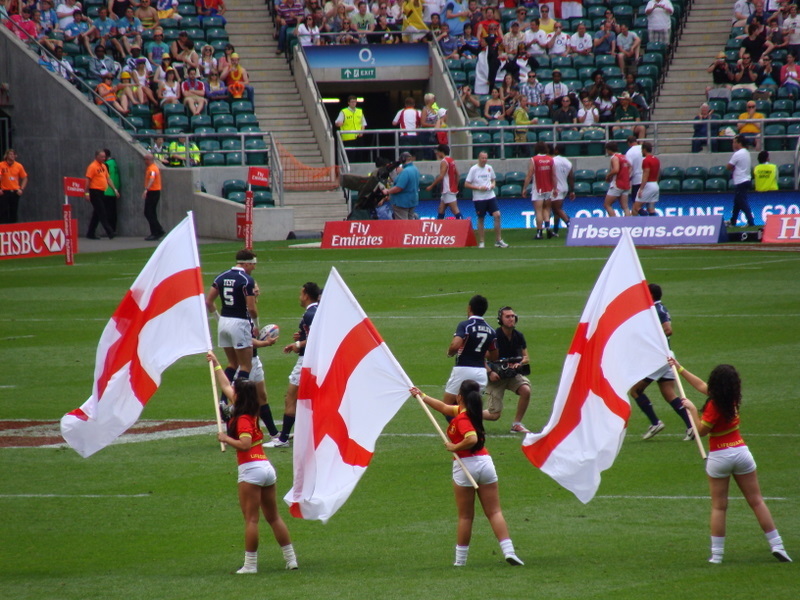 When England did appear for their first match, they were welcomed onfield by a swathe of red-and-white-clad young dancers, bearing St George flags. The crowd, to a man, jumped to their feet, screamed and applauded with excitement as the home side made their first appearance. The young men in front of us who, like many of their contemporaries, viewed the day as an excuse to go “on the p***” as they say here, actually paid attention to the game and jumped up every time England scored. Much lager was spilled underfoot, but who cares when your team is on the field? The red-and-white girls provided much entertainment throughout the day and, for the most part, not in the way they intended. A group of them lined themselves along the stepped aisle in our [north] section and within seconds, there were comments flying about relating to one of the young women who, some said, “clearly has her head on facing the wrong way”. We noticed an interesting quirk in the way Twickenham supporters responded to the different teams and matches played throughout the day. Generally, with the exception of national fans from the other countries, the crowd favoured any team that was the underdog in any match. Or any team playing France. It was a wonderfully fun and entertaining day, and one I’d definitely love to repeat next year. Witnessing how teams warmed up together and left the field together was quite moving. Many teams held on to each other as they withdrew to the dressing room between warm-up and match. We travelled to Twickenham crammed in a train full of colourfully-dressed fans, walked to the stadium in the midst of equally colourful and chirpy fans. Our return journey was slightly less crammed, but with fellow travelling fans in sentimental, almost maudlin, mood. I think today will dawn with many throbbing heads, but I’m pretty sure Twickenham will be equally full and do an equally brisk trade in sales of alcohol. I hope our Saffa team continues to do us proud. 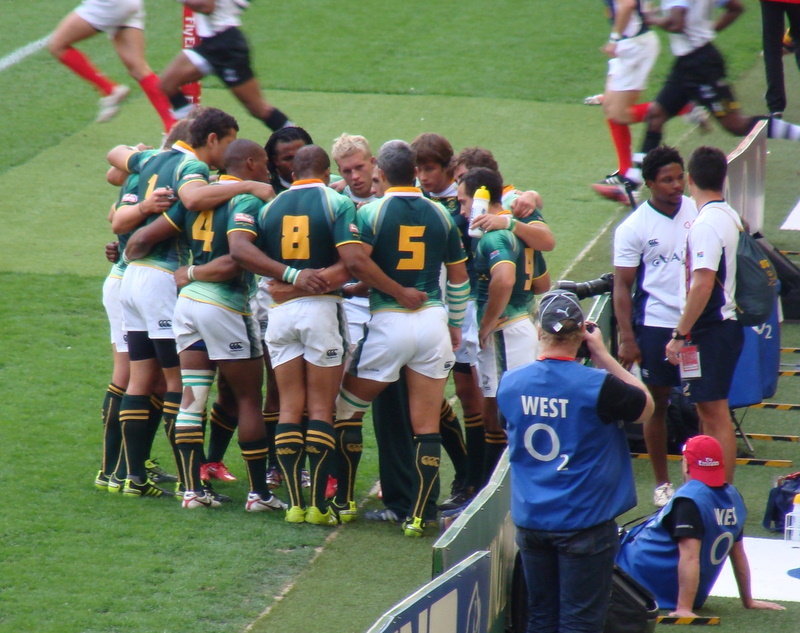 Go blitzbokke!